What is Burning Man? 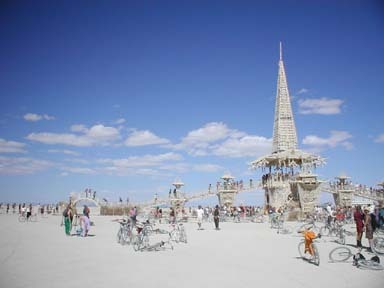 : Francis Irving What is Burning Man? It’s clearly an arts festival. Crazy large scale modern art, sitting on the beautiful stark canvas of the Nevada desert. Grant funded mechanical theatre. 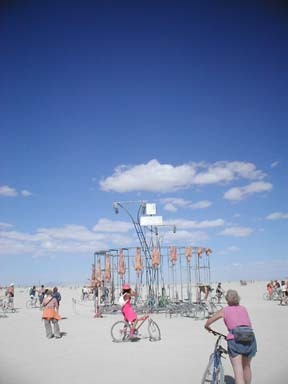 On the first evening, we were taken to these twenty-odd sculpted divers hanging from a mechanical wheel (photo right). James and I raced round to the powering cycles on the other side, and managed to get it spinning, a strobe light flashing every frame. Not fast enough. A few days later someone had hooked a motorbike up, it rotated smoothly and the diving-man sculptures leapt one after another into the desert. Walking round the playa and the camps, you’d stumble upon things this good everywhere. Actually it’s for personal art. Improvised theatre, dressing up, experimenting with new rules. Make that social art, a test-tube community. There’s no money at Burning Man (except to buy ice or illegal drugs), which made it the most refreshing holiday I’ve ever had. People give and share and help, making you want to do the same. There’s no “attitude”, no pointless altercations. Sounds like a bunch of hippies? Of course this community is partly an illusion. No money when we’ve all spent thousands in dollars to be there. Kindness, when it’s a yearly festival, we’re on holiday, not working, striving, competing. Yet still the experiment is worthwhile, and you come out instinctively “gifting” more in the real world. Did I mention drugs? Obviously Burning Man is just a big rave in the desert. Some German newspapers are apparently insistent that it’s an electronic music festival. I’m sure it was a cocktail festival, but that’s circumstances peculiar to my camp. In reality, drugs were there, but frankly unnecessary when it was trippy just looking at peoples costumes. Much as I enjoy trance after having listened to Digitally Imported quite a lot last year, there was a bit too much of it. 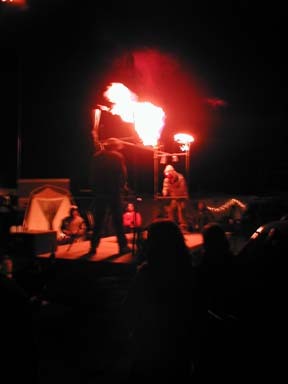 Much more fun was this person (photo left) from Illumination Village (where I stayed) who played percussion with burning propane. But also it’s a spritual festival. Quite reasonably accused of paganism, we do build a big wooden statue of a man and burn him on the last day, after all. It’s a festival like any religion has, in the ancient sense of being a yearly holy day, a break from normal life. Some veterans I met there measure there years from the burning of the man, remembering what they did and what happened relative to each festival. Lurking behind it all was a surprisingly coherent philosophy. You could deduce it from the messages people wrote on the temple (photo right) before it was burnt on the day after the last day. Most of the messages were to help deal with the end of relationships, and the death of parents. But some were more general, reminding each other to live in the now, that everything changes. To deal with life’s difficulties in an accepting way, also strong and resilient through understanding how small we are, how amazing we are. Yes it was a temple of trite phrases, but all true, and together forming something a little bit larger, which needs more description than this paragraph. A calmness. So that’s where I was last week. That’s Burning Man.